Melanie (Malone) O’Neil ’99 and her husband, Brian, are letting an unexpected passion take them on a journey. It started as a love story, really. A young couple—soon to be married—wanted to give their siblings a simple yet meaningful gift at their wedding but couldn’t find what they were looking for in stores. 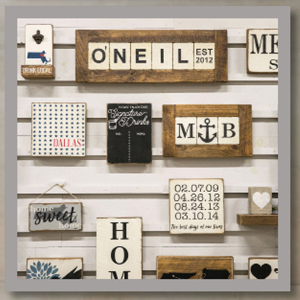 So the couple decided to make personalized signs for them, spelling out their brother’s and sister’s last names with white paint on blocks of old wood. Then, they went on their honeymoon to St. Lucia and Antigua for two weeks and turned off their phones. It was a fun hobby. Along with what was quickly becoming their signature block-letter style, the couple also started painting American flags on wood slats, an idea that grew out of a gift that Melanie had made for her dad. Everything they created was in their favored rustic farmhouse style. The newlyweds could have just left it at that and continued as planned in their new home, with their satisfying and secure jobs—Melanie, who had worked in global marketing at Reebok for a number of years had recently begun working for various startups while Brian worked in sales for a natural pet food company. But, instead, they decided to do something their friends and family thought was crazy—take a chance and follow what was quickly becoming an unexpected passion. The popularity of their signs continued to grow merely by word of mouth. A few months after their 2012 wedding, Melanie and Brian turned their hobby into a business and named it Rustic Marlin—coupling their choice aesthetic with Brian’s love of fishing (and a nod to the marlin he once caught)—and headed off to the Cohasset Farmers Market to test appeal. “If we sold $500 worth of merchandise, we felt successful,” Melanie says of their weekends setting up a stand and selling to the public. 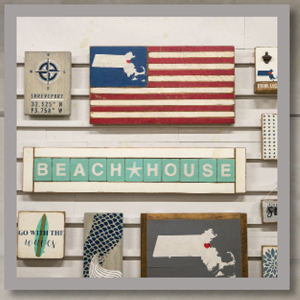 Their first major order came from Setting the Space, a home staging company with retail locations in Plymouth and Mashpee. “My sister-in-law was shopping there and saw a wooden American flag, but it was made in China. She told the shop owner that the store should sell flags from a local business and shared our website,” says Melanie. Setting the Space ordered $3,000 worth of merchandise and became Rustic Marlin’s first real account. What the couple was getting into was major growth. 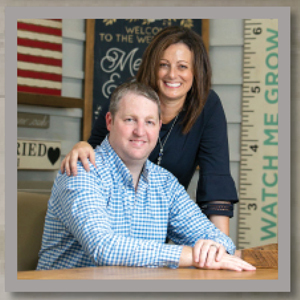 By 2016, Rustic Marlin had sold over $1 million worth of merchandise from their home, quickly outgrowing what Melanie and Brian’s garage and yard could hold. In August of that year, the company moved into a 50,000-square-foot headquarters in Hanover, with space for a wood shop, design and art, finishing, shipping, research and development, sales and marketing, as well as a showroom. With the new location came more business. Rustic Marlin now makes custom signs for L.L. Bean, Stonewall Kitchen, Life is Good and Black Dog. 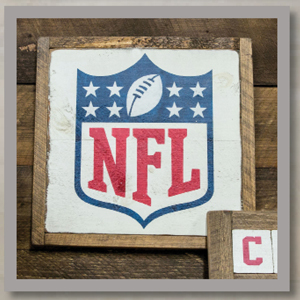 Last year, they acquired the official licenses to create premium sports décor for the NFL and the NHL and this year, they will have the NCAA license. That’s a big deal for the relatively small business, as each of these leagues gives only one official license to a home décor business. 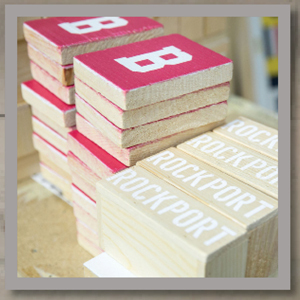 Rustic Marlin merchandise is also sold at retail locations throughout the country, such as The Paper Store. 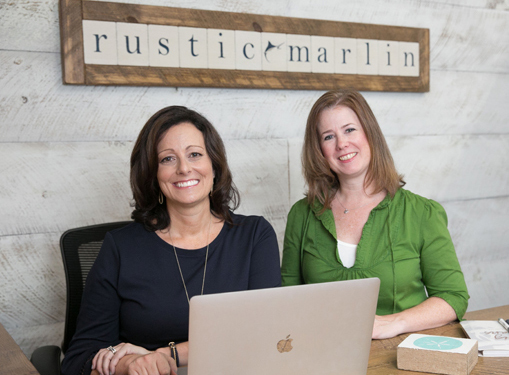 With a total of 60 employees and a catalog of more than 6,000 products, Rustic Marlin now has sales reps who sell to all 50 states. This past spring, the company experienced a record-breaking number of orders, and in August, it was ranked 366 overall among Inc. 5000’s Fastest Growing Companies in America as well as the number one fastest growing consumer products company in Massachusetts. “We never said that we were going to be a sign company,” Melanie reflects. And nothing in her life pointed in this direction. Growing up, Melanie didn’t have a natural interest in art or design. Actually, she wanted to be a dentist until her father told her to look in his mouth. “Then I realized that this is not for me,” she says. At Stonehill, she changed her major often, ultimately settling on Spanish. During her senior year, she decided to tack on a business minor, and with the guidance of Business Administration Professors Robert Carver and William Burke, she even completed an internship. “I believe you go to college to learn how to learn. You learn how to show up, learn how to tackle projects, work as a team, work independently, learn how to live with someone. Then you take that all with you,” Melanie says. This ability to learn how to learn may be one of Melanie’s most valuable attributes in business. 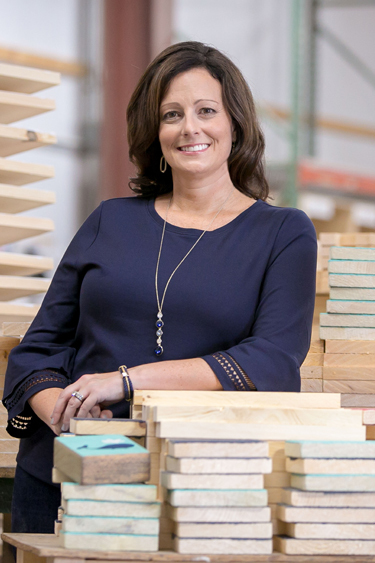 She admits that she and Brian don’t necessarily know how to make a wooden home décor business successful—they’ve never done this before. “I’m always asking questions. We go to trade shows and spend a lot of time talking to people who have lived and breathed what we are doing. Where do they buy their boxes? What bank do they use? We are always learning,” she says. 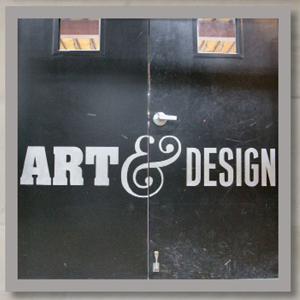 Staying true to its roots, all of Rustic Marlin’s signs are still handcrafted and painted. With the exception of machinery to help with woodcutting, there is no mass production. “That is what makes us unique. That’s our story,” Melanie says. Melanie understands the need to stay relevant in an evolving industry. Rustic Marlin started just before the rise of Chip and Joanna Gaines—HGTV’s popular Fixer Upper couple, credited with launching the appeal of modern farmhouse style. “Farmhouse is trending a lot right now,” notes Melanie. “We work to stay on top of it. Things like: Do people want more white than traditional rustic?” The company has an entire team that watches for trends and brainstorms new design approaches such as incorporating script fonts, metallic colors or rose gold, which seems to be everywhere these days. They have also branched out beyond signs to bottle openers, wine racks, trays, coasters and shelving units and are heading in the direction of restaurant and office design. There is a joke at Rustic Marlin: Eat, breathe, sleep sawdust. It is a lot of work to start a business from the ground up. Melanie notes, “You have to put this first if you are going to take a risk of this size.” And you have to keep your eye on the ball—a catchphrase that Melanie’s dad often said to her growing up. As she says, “It is true for softball but also for life.” Fittingly, Melanie made an “Eye on the Ball” sign and gave it to her dad for his birthday. No matter how many hours she’s at work, Melanie makes her own family and friends a priority. She is particularly close with her young nieces and nephews, who are often featured on the company’s Instagram feed and who like to “play Rustic Marlin” at home. She is also committed to her Stonehill friends. “I can honestly say that if I needed Melanie right now, she would drop everything and be here immediately,” says Catherine Kearney ’99, who met Melanie her freshman year and then lived together in a townhouse, forming a group of friends they refer to as the Amesbury girls. “She will drive two hours in the middle of the week just to meet up with us,” says Kearney. Melanie recalls going to Stonehill’s career services department during her senior year—before the days of online job searching—and looking through “those big binders” for interview opportunities. It worked. She was offered jobs right after graduating. She is now giving back to her alma mater. Revisiting the College’s Career Development Center via Handshake, its online job posting site, and the Stonehill Connect Mentoring Database, Melanie has hired Stonehill interns to work at Rustic Marlin in several departments. Kate Stallings ’17 was one of those interns. While the two didn’t connect initially through Stonehill, they have since further bonded through their shared Stonehill experience. “We have definitely talked about our different courses and professors and the buildings—where she lived on campus versus where I lived on campus. We still bring up our times at Stonehill. Those four years are really formative, so it shapes who you become as a person. It’s a camaraderie,” says Burns. Rustic Marlin is also listed on the Stonehill Alumni Association’s Purple Door Network so that alumni can connect with the company. Actually, one of Melanie’s first employees, from when Rustic Marlin was still in her Millis home, was then-16-year-old Emily Maltinsky, a current Stonehill senior. “Mel always raved about her years at Stonehill and how much she genuinely loved the school. Her love and appreciation for Stonehill inspired me to apply and ultimately attend the College,” recalls Maltinsky.